And Nutrition Advice That's Available? ...Then you need to read this book! healthier, happier, and more active life that your doctor will never tell you. 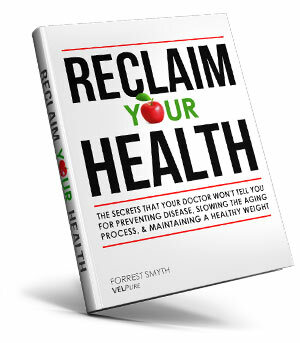 Facebook' button to download your FREE copy of 'Reclaim Your Health'. I hate spam too! - Your email will never be shared and you can unsubscribe at any time. "Here is a book that stands out from the crowd. Sensible, intelligible language that strips away the faddish nature of modern dietary hyperbole and focuses on the truths about food and diet that have stood the test of time. The author has stepped away from the supermarket shelves to examine the key elements of the relationship between food and health that pre-existed the mass market supply of food. He has identified what previously kept humanity free of the modern disease syndromes without the need for a plethora of chemical supplements and without the paranoia of what food product is going to kill us next." "If you're after a 1-page cheat-sheet or 'magic pill' solution to your current health issues, this book is probably not for you. It's a solid (but entertaining) 115 pages containing some quite confronting 'home truths' into why so many people are overweight and suffering from 'modern' diseases like diabetes, arthritis, and Alzheimers. I can't believe this book is free!" "This book is well constructed and easy to read. It will resonate with those looking for a commonsense and profoundly simple way resolve the chaotic advice on how to achieve and maintain healthy living. It ticked all my boxes." ThIs promotion is in no way sponsored, endorsed, administered by, or associated with, Facebook. By entering this promotion, you release Forrest Smyth, VelPure.net, VirtualSilver Group Ltd. and Facebook of any liability liability regarding any and all matters related to your participation in the promotion, as well as acceptance or possession of the prize. - No purchase is required to enter or win the sweepstake competition. - The sweepstake is not open to residents of those countries and local municipalities where such sweepstakes are not allowed by law. - Monthly Sweepstake prize is one bottle of VelPure Ultra DAV Extract plus free shipping (worth $79.95 plus $10 delivery worldwide). - The more points you have, the greater your chances of winning. - One sweepstake winner will be drawn at random each month. - The sweepstake competition and rewards program are open to contestants worldwide. - Contestants signing up through their own link will be disqualified. - The rewards program are open to contestants worldwide. - Earn 70 reward points to be eligible for a $15 credit toward any Velpure product. - Earn 130 reward points to be eligible for a $30 credit toward any Velpure product. - Earn 190 reward points to be eligible for a $45 credit toward any Velpure product. The winner is responsible for all federal, state, provincial and local taxes (including income and withholding taxes) and any other costs and expenses associated with prize acceptance and use not specified herein as being provided. Winners may not substitute, assign or transfer prize, or redeem prize for cash, but Sponsor reserves the right, at its sole discretion, to substitute prize (or portion thereof) with one of comparable or greater value. Except where prohibited by local law, by participating, entrant agrees that Sponsor, its parent, affiliates, subsidiaries and advertising and promotion agencies and all of their respective officers, directors, employees, representatives and agents (collectively, “Released Parties”) will have no liability whatsoever for, and shall be held harmless by entrants against, any liability, for any injuries, losses or damages of any kind to persons, or property resulting in whole or in part, directly or indirectly, from acceptance, possession, misuse or use of any prize or participation in this draw. Persons who tamper with or abuse any aspect of the draw or website or who are in violation of these Official Rules, as solely determined by Sponsor, will be disqualified and all associated entries will be void.